John Kelly was born in the district of Rehy West, County Clare, and for over thirty years was a force in Irish music – he was a member of SeÃ¡n Ã“ Riada’s CeoltÃ³irÃ­ Cualainn, of the Castle Ceilidh Band, and of CeoltÃ³irÃ­ Laighean, and regular musician at respected Dublin sessions. 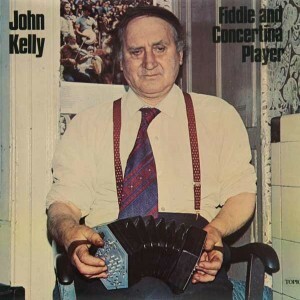 John’s fiddling is in the relaxed Clare style and his concertina playing is spikier, with subtle variations of notes, the occasional harmonic effect, and again that off-beat emphasis. John taught at the Willie Clancy Scoil Ã‰igse, and supported the Tradition Club held on Wednesdays at Slattery’s, just a few doors away from his Dublin home: he was recorded by John Tams and Neil Wayne in January 1974 and by Tony Engle and Patrick Hayes in March & April 1975. Produced by John Tams, Neil Wayne and Tony Engle. First issued by Topic Records 1975.